Congratulations to Terry Jones (VPA ’16) whose movie, Soup For My Brother has been named Best Documentary at the Liverpool International Film Festival (LIVIFF) in Liverpool, England. The film had its European premiere at this festival on November 17, 2016. 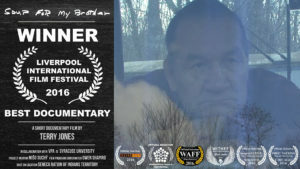 The 10-minute documentary was produced and directed by Terry Jones (bio), a Seneca filmmaker, and it was filmed on the Seneca Nation territory, which is located about 50 miles south of Niagara Falls. The filmmaker wishes to thank the film festival and its organizers for acknowledging his short film. Terry was pleased that an Indigenous film could have appeal outside his Native community and the United States. This film was produced with no financial budget and the film crew consisted of the filmmaker and his father (James C. Jones). Terry would also like to thank Syracuse University, the College of Visual and Performing Arts (VPA) and the film’s mentor Miso Suchy The film was produced as part of a final film project in a documentary class offered by Professor Suchy. Terry graduated in May 2016 from VPA with a degree in film and he was part of the Renée Crown University Honors Program. According to the festival’s Facebook page, LIVIFF received over 2,600 film submissions and they selected about 100 films from all over the world. SUMMARY: Today is a special day for Jimmy’s brother, Danny. As Jimmy prepares a batch of soup for his brother, we learn this documentary is about tradition, brotherly love and loss. If you would like to preview, rent or purchase this film, please contact the Canadian Filmmakers Distribution Centre (CFMDC), who are the film’s official distributor and sales agent.